Every year we have to have the ultimate cookie for Santa. You know the one. It has to have at least 3 1/2 pounds of sprinkles, because Santa LOVES sprinkles. It has to be larger than any other cookie, because Santa LOVES cookies. And most importantly, it has to be made by a child because Santa would know if it weren’t. Add egg and extract beating just till incorporated. Mix together salt and flour, then add to wet ingredients mixing only till blended. Split dough into 3 or 4 equal sized lumps, flatten lump into a disc about 1/2 inch thick and wrap in plastic wrap. Refrigerate for at least 3 to 4 hours or overnight. Preheat oven to 350F. 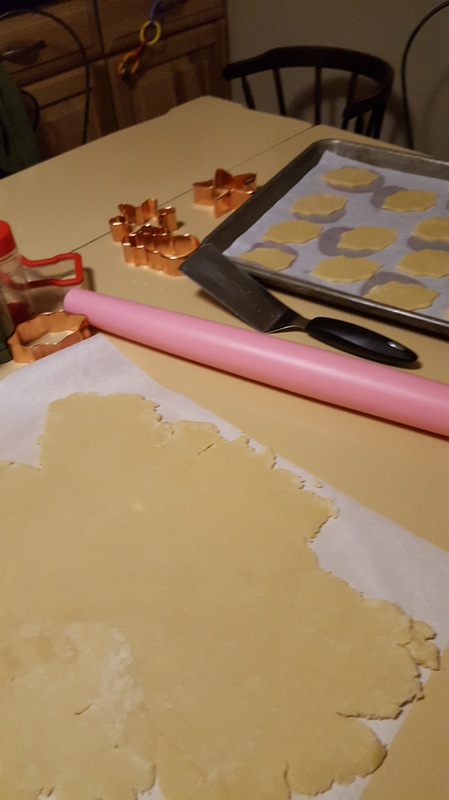 Line baking sheets with parchment and set aside. Working with only one package of dough at a time; unwrap dough, place between two sheets of parchment and roll to about 1/4 inch thickness. Dough may also be rolled out on a clean floured surface. NOTE: By rolling dough between layers of parchment, you can roll and re-roll dough several times without changing the molecular make-up of the dough. When rolling with floured rolling pin on a floured surface, dough can only be rolled out once. Flouring the surface adds too much flour to the dough and toughens the dough too much. 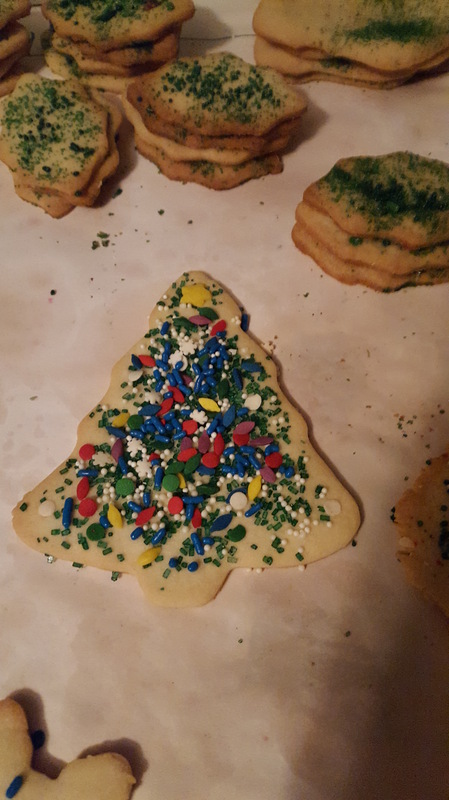 Decorate cookies with sprinkles, colored sugar or jimmies, if desired. Bake at 350F for 8 to 10 minutes or till cookies just begin to brown around edges. Cool on sheets for about 3 minutes then remove to cooling racks to cool completely. Cookies should be kept in an airtight container at room temperature for no more than 2 weeks. 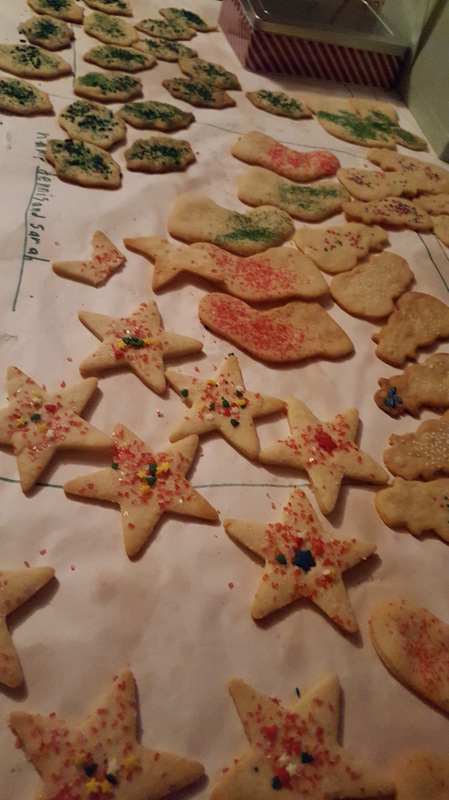 These kid made cookies are all candidates for THE Cookie for Santa. More than enough sprinkles for any elf!